The Internet is a key resource for text complexity. We are in a day and age where information and resources are at our fingertips. I frequently see people use the Internet to look up recipes, movie listings, and news; however, I still don't see it as a natural source for engaging rigorous learning in the classroom. Why? Maybe it's a matter of understanding what text complexity is really asking us, or how to create rigorous and deeper engaging tasks associated with the text. Those of us who are transitioning to Common Core standards know that text complexity will affect the rigor in our classrooms. The Arizona Department of Education (ADE) issued a letter informing us they will increase the text complexity as well as higher Lexile levels on the current AIMS test this year to help transition to the PARCC assessment. This means we need to understand what text complexity is and how to address it right now, regardless of what grade/subject we teach. Text complexity reminds me of a s'more. It contains three main parts, and while you can talk about each ingredient separately, it's not really a s'more until you put them all together. Understanding the quantitative ingredients are important, especially when thinking about selecting text for independent reading and guided reading. However, it's not the be-all and end-all for selecting independent reading. Teachers and librarians shouldn't tell students not to read a book if it's above their reading level because the student might be highly motivated to read that text regardless of it being "above" their reading level and therefore might be highly successful with reading it. Furthermore, teachers can't shy away from exposing text that is much higher than their independent reading levels because students need to grapple with rigorous text. This is where teachers get to "teach" by providing guidance and scaffolding for the students. Find a Book -- You can look up a book's Lexile by title, author, keyword, or ISBN. Lexile Analyzer -- You can scan your text (or type it in) to see the complexity of what you've written (or text in any website). Note, you'll have to register to use this site. Register for The Lexile Framework for Reading free account. Then, register for The Lexile Framework for a Reading Educator's account. ATOS analyzer -- On this site you can find the ATOS scores of books as well as your own documents. AR book finder (ATOS) -- Search for book titles based on authors, topics, or titles of books. ATOS for (short) text -- Use this site to determine the ATOS score of a short text (submit your document). ATOS for (longer) text -- Use this site to determine the ATOS score of a longer text (submit your document). It is so important to understand that a book can not be measured quantitatively alone. Qualitative ingredients must be considered. For example, I Know Why the Caged Bird Sings is given an ATOS score of 5.5, however I do not believe it is appropriate for a 5th grader (by the old measure, and a 4th grader by the stretch ATOS score). I read that book in college! Another example is The Hunger Games, which is given an ATOS score of 5.3, however the qualitative measure puts it more at a 7th grade level. This is where we tap into student interests, which will push students to read rigorous text and more non-fiction text. Knowing our students, and their interests is key for this ingredient. It's the graham cracker in the s'more because it's what holds the qualitative (marshmallow) and the quantitative (chocolate) together. One way to harness their motivation is through an engaging task. No longer are we asking students to just answer knowledge and comprehension type questions one at a time or to fill in their worksheet, but instead to engage them with a meaningful task. How are we Boosting Text Complexity? Many educators in our district are turning to poetry, as a way to boost text complexity. This makes sense, plus it's one of the listed types of text complex exemplars in the CCSS Appendix B. The caveat to this is Appendix B is not a shopping list for what your grade level needs to run out and buy. It's merely an example of how to use the text, which includes example performance tasks. It's more than just changing the material educators are teaching with, they also need to change the behavior of how they use the text. They need to create 21st century, student centered learning, which is partially done by creating rigorous and engaging tasks. Expose them to a variety to types of text, and tap into their interests to create student centered learning. 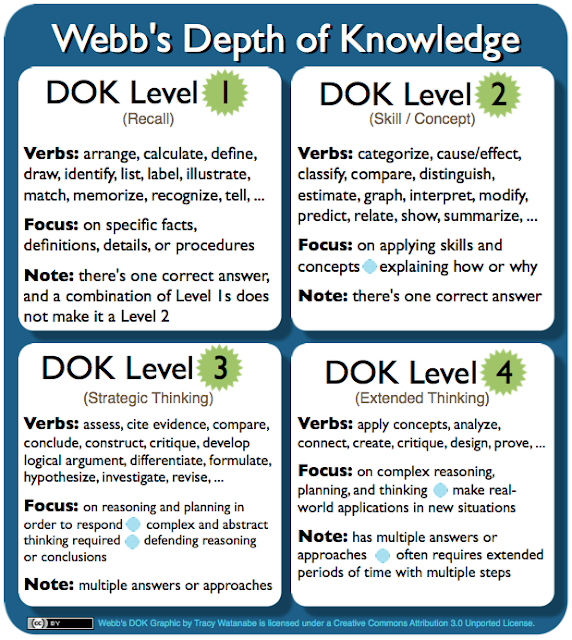 Take Depth of Knowledge and the Hess Matrix to create deeper thinking and engaging tasks. This is where I see the Internet as a key resource for text complexity! We have a plethora of rigorous text online to tap into. We can use one of the sites listed in the quantitative section above to determine the ATOS or Lexile measure of the site (you might need to copy and paste the text into a document). However, if we ask our students lower level questions, then don't expect a lot to change with their engagement in the text. One of my colleagues suggested that students just Google the answers, which is why teachers shy away from the Internet. So, why are we still asking questions they can Google?! Why aren't we asking questions that require them to compare a variety of sources and perspectives that has them to dig into multiple texts? Below are a few examples for comparing text and perspectives. Synthesize primary sources of information on the same topic from different perspectives. Design an infographic or a model to share this complex situation. Compare secondary sources of information to the primary source. Did the interpretation of the writer/speaker stay true to the intended message? Defend your claims with evidence. Use news and current events to dig deeper into text. For example, The New York Times' Learning Network recently posted that, "Archaeologists believe that they have discovered the remains of Richard III. Citing evidence from the text, explain why this discovery may change history’s view of Richard III. Include at least two specific examples from the article in your one-paragraph response." If your class has just read one of the Strega Nona books by Tomie DePaola, then ask the essential question, "How do authors create their characters and plots for their stories?" Read what DePaola says about creating the Strega Nona books. If your class just read Eric Carle's The Very Hungry Caterpillar, then compare it to the real life cycle of a butterfly to see how accurate Carle's book is. Teach them how to be detectives as you look at other sources. 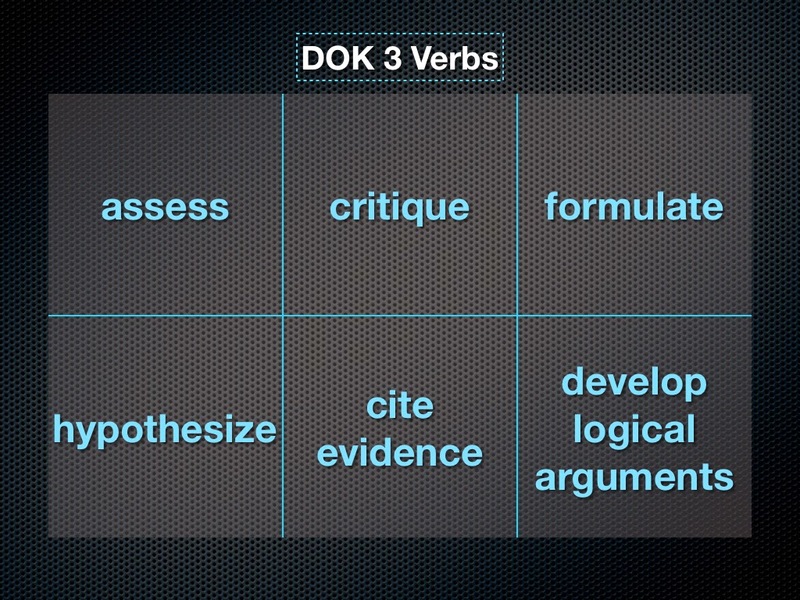 Host a discussion based on evidence from other sources. Suppose you have a class full of avid soccer fans. Ask them, who will win the next World Cup? Defend your claim with evidence from past records, statistics, and strategy. Host a debate. While you are bringing in other resources to address text complexity such as poetry and the enrichment parts of our reading anthologies, consider the Internet as an amazing resource to tap into. 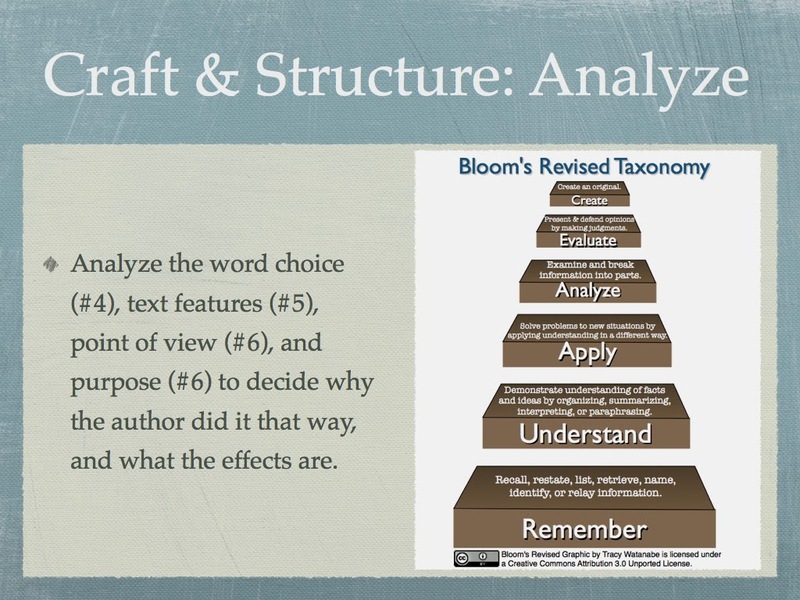 Point them towards rich sources of text complexity. Give them choices that tap into their interests. Engage them in valuable tasks that are meaningful outside the four walls of the classroom. What resources are you using to address text complexity? How do you create engaging tasks? What other examples would you add to this list? How else did you connect with this post? 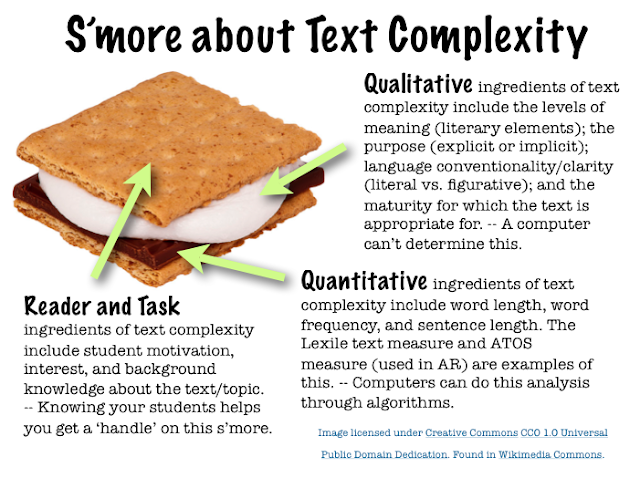 Our state will focus on SmarterBalanced rather than PARCC as our assessment model, but the need to understand text complexity is one of the first strategies teachers need to consider. Thanks for helping me understand how to start the process of designing curricula for text complexity with rigorous assignments that scaffold strategies for student understanding. Thanks so much for your feedback on both this post and the flyer I created, and for placing them in your livebinder. You are right, text complexity is a main consideration with the Common Core, because it'll impact all other areas of Common Core as well, as evident in the assessment. While I'm more familiar with the PARCC, there are some ideas I'm getting from looking at the Smarter Balanced Sample Items and Performance Tasks, and especially what New York State created regarding the assessment. While I'm not big on high stakes assessments, there is value in knowing how they will be assessed -- and seeing text complexity is in every single question really stands out to me. Learning with you is fabulous as always. Thanks for your posts on the Common Core, in particular the post about text complexity and text evidence and the post with the fabulous 21st century, student-centered learning task.